Home Plus Model Pro Model Deluxe Model Premium Deluxe Model Comparison Chart & Specs. If You Have Technical or Warranty Issues with Your Juicer We Are Here to Assist You and Provide Customer Service. Why Buy A Super Angel Juicer? All Stainless Steel construction and state of the art technology. Four Models - Choose the model that meets your needs. Highest quality extraction of nutrients and live enzymes with minimal oxidation due to Low 82 RPM. Almost 20 to 30% more juice extracted compared to other juicers. No plastic parts - The Twin Gears are solid stainless steel, whereas other brands use a lower strength stainless steel and have plastic screw ends that can break. The 2015-2016 models are newly upgraded, fully automatic, with a 10 Year Warranty. The Super Angel Juicer is at the pinnacle of quality and work performance both in name and reality. Achieve Your Health Goals with the Super Angel Juicer! Unique design with remarkable extraction power makes the Super Angel simple to use and newly designed parts make for easy clean-up, assembly and disassembly. High quality, solid stainless steel SUS-304(18-8). No breakable plastic edges. State-of-the-art design. No plastic toxins. Low RPM almost eliminates oxidation, keeping more enzymes intact and producing high nutrient juice. 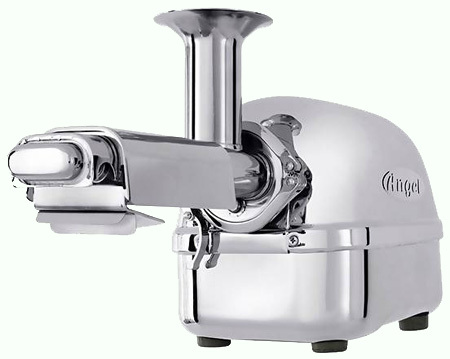 The Super Angel is the lowest RPM twin gear juicer on the market. The high quality FDA-approved stainless steel twin gears run at 3 HP grinding force, allowing you to juice fibrous produce quickly and smoothly. The Super Angel can crush cellulose fibers, extracting nutrients locked inside. Efficient juice extraction: Stage one applies concentrated pressure to the fruits or vegetables. Stages two and three grind and continuously process the fruits or vegetables, producing very dry pulp and more juice. Dual three-stage screen handles most fruits and vegetables. The powerful motor provides maximum squeezing and helps produce maximum juice quantity. The impeller press system of the twin gears enables continuous juicing. The Super Angel removes over 90% of agricultural chemicals and toxic substances from the surface of fruits and vegetables by separating the juice and the pulp. The Super Angel can juice almost anything from carrots and apples to wheatgrass and pine needles. In addition to making juice, the Super Angel supports soybean juicing and the making of tofu, nut butters and frozen fruit sorbets. A thermal protection device and anti-jam action offers safe use and peace of mind. The automatic motor thermostat helps prevent the motor from overheating. Six safety devices include: Automatic Heat Sensor, Extra Rocker Switch, Internal Gear Protection, Reinforcement of Switch Panel, Double Protection of Motor and Main Housing Unit, and Screen Housing. Specially designed, the motor cooling system helps prevent the motor from overheating and helps keep the juicer as quiet as possible. Ultra Precision 3-stage twin gear system with powerful heavy duty motor bring the maximum extraction of juice, which creates very dry pulp and, as a result, more juice. The Super Angel is hand-built and precision-engineered with the highest quality stainless steel. All major parts including motor, gear box, cooling systems, safety sensors & control panel are newly upgraded and reinforced to comply with U.S. electrical specifications.